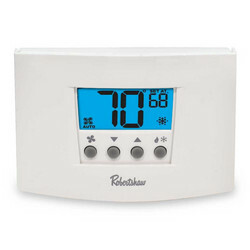 The Robertshaw RS6000 thermostat family is Simply the Right Choice when it comes to daily programmable temperature controls that can save energy and money. With the comfort, convenience, and efficiency features that homeowners and contractors want, the RS6000 family provides EnergyStar and California Title 24 compliant features for an affordable price. 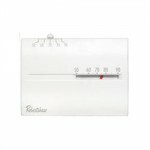 Auto Changeover: Switches automatically between heating and cooling for constant home comfort. 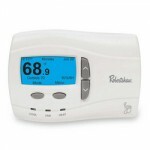 Pop-Up Wizard: Launches instant installation menu to quickly enter the settings for programmed thermostat functions. Bigger Brighter Backlight with Nightlight Option: Makes viewing and setting the temperature easier any time of the day. Worry-Free Memory Retention: Maintains set point and programmed parameters, even during power outages. Easy Change Battery Access: Provides drop down removable compartment for quick battery replacement. Circulating Fan: Maintains optimal air circulation between demand cycles for improved comfort with minimal energy use. 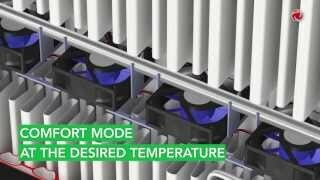 Low Temperature Freeze Protection: Turns on heat automatically when temperature goes below 41°F. Protects pipes from freezing. Adjustable Temperature Differential and Upstaging: Provides for full selection of parameters to deliver maximum comfort or energy savings. High and Low Setpoint Limits: Protects the heating and cooling systems by limiting temperature settings.